Christmas season has many hallmarks that make it such a magical time of year: the smell of pine needles, wrapping presents for loved ones, spending time with family, and the twinkling of Christmas lights. Christmas lights add warmth and holiday spirit to this season, and Thurston County is full of locations to see them. For an evening of holiday cheer, take a drive with friends or family to see as many of these displays as possible, complete with hot chocolate and Christmas tunes. Use our map below for directions to these extravagant displays of festivity. 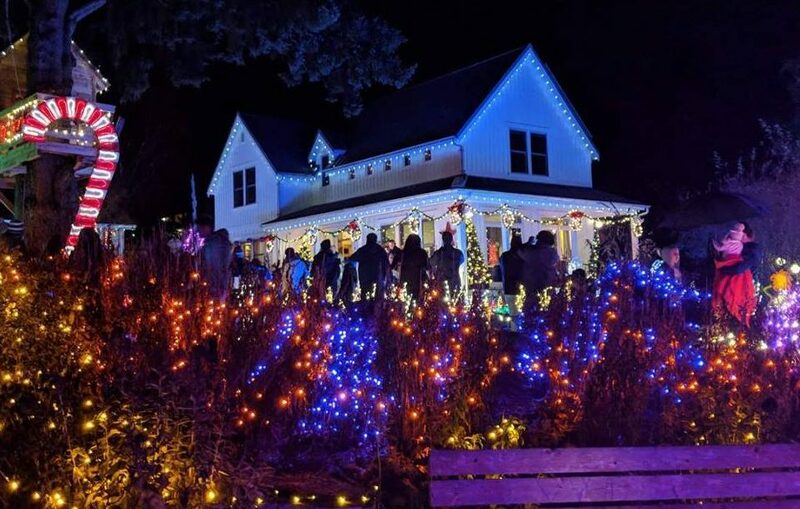 The Cottage Treehouse’s annual lights display, put on by Steven and Susan Hurst, features hundreds of thousands of lights to walk through, along with a gift shop complete with cider and cookies. 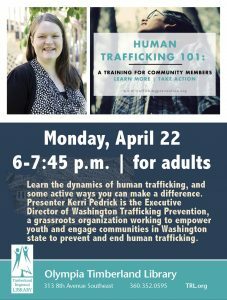 Donations for the Olympia Union Gospel Mission in either food or cash are encouraged. Located in Hawk’s Prairie, Tony and Maureen Cook decorate their home and yard with trees, lights, and animated figurines such as Santas, penguins, reindeer, and snowmen to create an outstanding display. This year will be their 21st year of putting on their Christmas lights show. The Cook’s home is in a neighborhood known for extravagant Christmas lights, so be sure to check out their neighbors at 7434 44th Avenue as well. 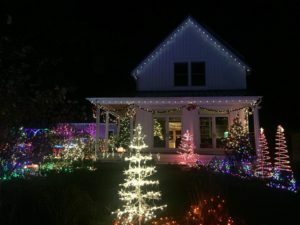 Whitney and Luke Bowerman of Oly Lighstravaganza have been putting on their lights show since 1990, and this is regarded as one of Olympia’s most extravagant Christmas light displays. Both very creative people, the Bowermans pride themselves on creating a significant portion of their display themselves. Oly Lightstravaganza has a cookie booth open on select nights, and also accepts donations to the Thurston County Food Bank. 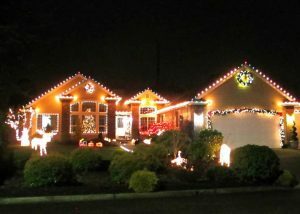 The Cove neighborhood, located on Henderson Boulevard, features an entire street lined with houses illuminated with decorations. Be sure to take a trip through this neighborhood to get in the holiday spirit. A little further of a trip down Yelm Highway will take you to the Farm neighborhood, another community known for their Christmas lights display. This lively display features custom cut-outs of cartoon characters, both modern and from the past. The display can be either driven or walked through. Head to downtown Olympia to observe Twinklefest, a competition of storefront light displays. 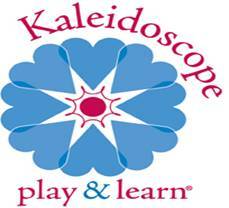 Starting on December 1, voting is open to declare a winner for the most spectacular display. Downtown Olympia is also decorated with illuminated snowflakes, lights on trees, and other holiday decor. Every year, the planted Korean fir at Sylvester Park is decorated with Christmas lights. Stop by while in downtown Olympia to stroll through the park, illuminated with twinkling lights. Following the Lacey Parade of Lights on December 3, the Christmas Tree in Huntamer Park is lit for the season. Take a walk through the park any time after dusk to witness this classic Christmas decoration. Maytown Assembly of God’s Christmas Island is a nativity scene adorned with lights and decorations. This historical Christmas display had been happening since 1941 in varying locations across Thurston County before settling at the Maytow n Assembly of God. Stop by on a Friday, Saturday, or Sunday for food and drinks in the heated barn. Donations to the church are accepted.